What started out as a grey drizzly morning with a good possibility of strong winds before we even got started, turned out to be a most successful day. Sailors from the Long Beach Group of clubs from Beaumaris to Frankston began turning up from before 8 a.m. onwards. A couple of minor issues took the attention of the officials for some time trying to bring all our member volunteers to sure when the entrance to Kananook Creek was almost blocked off by a build-up of sand at the entrance. Even the ribs found it most difficult. Even so we managed to have the race management meeting almost on time followed by the information session. A special mention to Garry for staying out on SG / DOM II whilst everyone else was socialising ashore and a further acknowledgement to those members who motored down in SG, DOM II & The Duck and then back again without being able to attend the BBQ and presentation. These are the people that allow a regatta like this to take place, certainly not just the sailors. Bart made a special effort to attend and soak up the atmosphere of an event that hopefully will be long term annual. 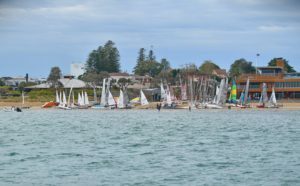 The light breeze was slowly strengthening as all boats left the beach heading out to one of the two courses laid down for the monohulls and catamarans. For the mono-hulls there was an inner and outer buoy as we do at MSC due to the large range of yardstick classes (from Minnow to Sharpies). With a northerly wind and wave conditions similar to Mordialloc FYC managed to get in three good races in between a number of large shifts and anything from 5 to 20 knots of breeze. 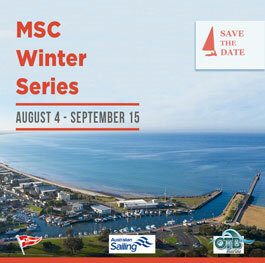 After the division winners were announced (which Mordialloc were among), a perpetual trophy for the best club being defined as the number of boats registered and the number of finishing boats was announced as FYC. It was a well-deserved win with Parkdale YC second and Mordialloc third. This type of event will certainly be conducted again next season with the host club being Beaumaris yacht Club. A postmortem meeting will be conducted by offices from all clubs to ensure that next year will be even better, more more publicity and an even bigger fleet.